Our Dunedin office opened a smart room in July demonstrating some of the life-enriching possibilities emerging with new technology for Kiwis who are blind or have low vision. Our clients and their supporters now have the opportunity to check it out. 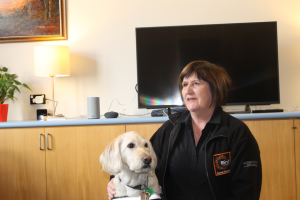 The room, funded by Dr Marjorie Barclay Trust who the Blind Foundation has a long-standing partnership with, features an Amazon Echo smart speaker linked to other appliances such as blinds, fans and lights, controlled using voice commands. It also features a Sony smart TV and an Apple TV showcasing each appliance’s accessibility features such as reading out the TV guide for viewers as well as changing channels using voice commands via the smart speaker. Thomas explains that while emerging smart technology for the home is exciting to many, the smart speaker concept is particularly exciting for the blind and low vision sector because it is audio-led. “The Blind Foundation seeks to enable our clients to live the life they choose, and in many cases this is about enabling access to information and solving problems for living independently at home. Smart speakers and home automation are a wonderful intersection of these two aspects. Bryan says that once the home automation systems are setup, the applications are easy to use. The organisation aims to establish more smart rooms throughout New Zealand to showcase to clients, their family and supporters how technology can assist them. It is also developing functionality that would enable information such as the Blind Foundation’s accessible library to be provided through smart speakers. Blind Foundation clients and their supporters are able to come along and try out the technology for themselves, to see how it works and what works for them. The room is open on Mondays from 1.30pm to 3.30pm at the Dunedin office: Corner of Hillside Road & Law Street, Dunedin 9012. Show up between these times to check it out.